QLab 3 uses AVFoundation to render video which is a change from the video engine used in previous versions. Applications such as iTunes11 and Final Cut X use this engine as well. Media which worked in previous versions may not work in QLab 3.
apcs ProRes 422 LT Recommended for general use. ap4h ProRes 4444 Use for videos with an alpha channel (transparency). It should be noted that the extension at the end of a media file is merely a wrapper and not an indication of the video codec contained. A wrapper is similar to a box as it is just holds the content with in it. A wrapper can hold many different types of contents such as video and audio which are encoded with a codec by the publisher of the video in order to reduce the size of the file and then decoded by QLab. It is best to create content which matches the size of your video surface(s) although not a requirement. QLab 3 has support for the open-source framework Syphon. This enables QLab to ingest and deliver full-frame video to/from other syphon-enabled applications. Available Syphon inputs will automatically appear as camera cues and Syphon Outputs can be created when setting up a video surface. Up to eight Live Camera feeds can be brought into QLab via Firewire, USB, Thunderbolt, or PCI Bus Devices. QLab 3's camera cue provides access to all current Blackmagic Design DeckLink, Multibridge and Intensity products (as of October 2013). Video surfaces reflect your multimedia scenario and make programming quicker in multiple-device configurations. Surfaces are made up of screens whcih are the projectors, televisions, and other output devices you will use in your production. Video surfaces have buit-in edge-blending and the ability for custom corner-pinning . QLab outputs video atop the desktop of attached displays so when there is no video playing then the desktop background is visible. To set your desktop backgrounds to black click on Tools and then Blackout Out Desktop Backgrounds . Click the Settings Icon [the sprocket in the bottom right of QLab] and then click on the Video section. There are two operating modes when using QLab for Video - Full Screen and Custom Geometry. Custom Geometry - allows you to choose an exact position video along the X,Y, and Z axis and choose the the scale of your content. There's no wrong answer and either mode can be selected on individual cues. This setting is just choosing which modes new cues will default. Click the + icon at the bottom left of the Video Settings window to create a new surface. Click "Edit" next to the new surface to open the Surface Editor. Click the + icon in the surface editor to add the displays you wish to be a part of this surface. Dimensions - Width and Height in pixels of the total size of the video surface. Partial Screens are useful when using display expanders such as Matrox TripleHead2Go devices. QLab breaks displays into Virtual Screens and allows you to perform edge blending and corner-pinning for each display attached to the display extender. Partial screens support up-to a four-wide configuration with each attached device. Adding a syphon screen will allow QLab to mirror the surface to another syphon-enabled application. You can only add one syphon screen per surface but can use multiple screens for multiple syphon outputs. Tip: Syphon is a valuable tool in pre-programming because it can stand-in for a physical device. If you need two displays then add two surfaces with syphon and use the Syphon Simple Client and Recorder application as preview monitors. To assist with the adjustment of screens each screen has the ability to display a test pattern by checking the Grid text box to the right of the screen. Origin - the position (X,Y) in pixels in which the screen is located within the surface. Corner Pin - drag the yellow dots on the outside corners of a screen inward to fix projector keystone effects. Note: You are not able to go outside the boundaries of a surface with corner pin. 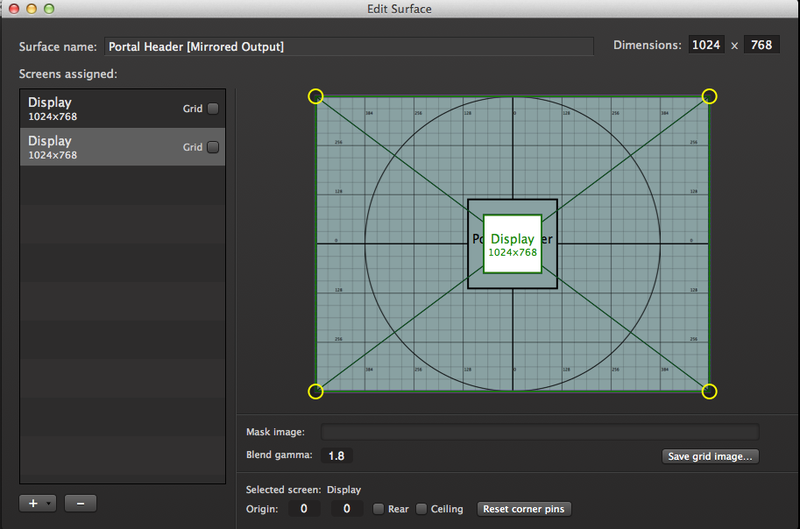 If two or more displays within a surface overlap more than 90% then their outputs will mirror. A common technique to create larger projected images is to overlap two or more projectors. 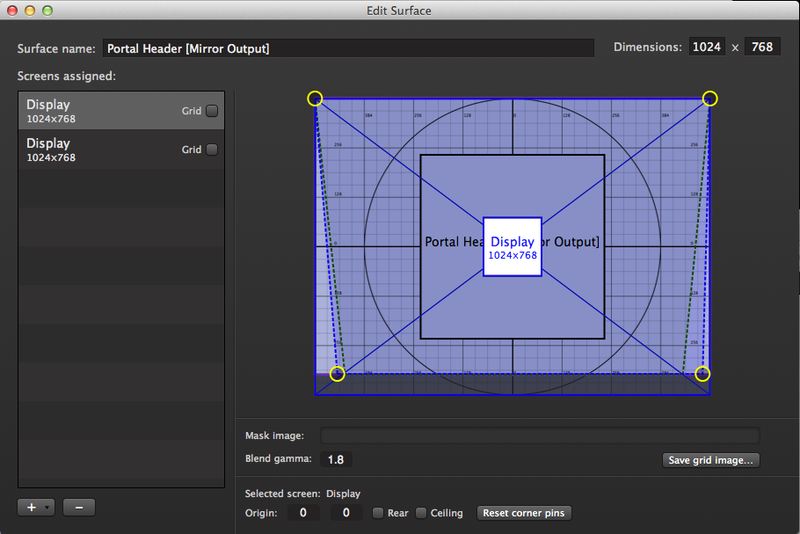 When displays overlap within a surface, QLab automatically creates a gradient between screens to perform edge blending in order to create a seamless image. Blend Gamma - This is the adjustment of the edge-blend gamma per surface. Note: since version 3.1.7, “shutters” have been replaced by “constraints” thus we can no longer drag edges of the surface. Following paragraph is therefore deprecated. Dragging the outside edges of the suface window inward allows you to shutter parts of the image. Masked sections will appear darker to indicate a shutter has been pulled in. 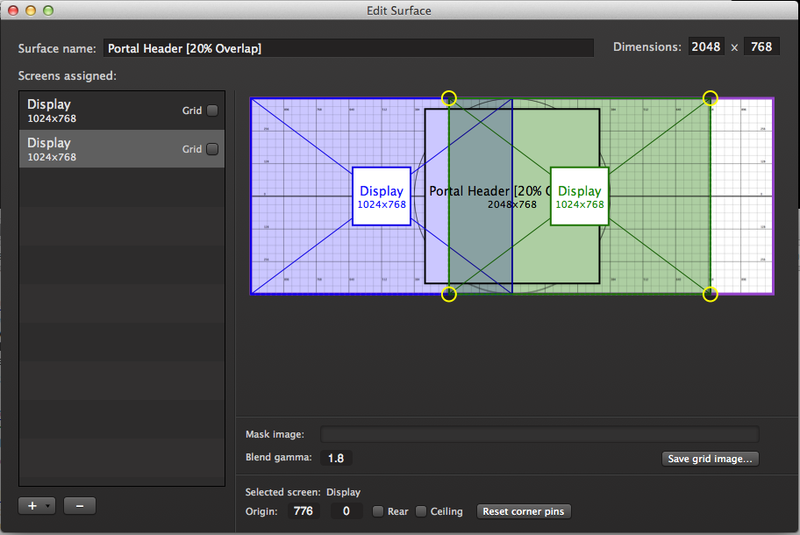 Save grid image... - This action saves a copy of surfaces' grid image in PNG format to aid in masking. The image exported will not have an indication of the screens being used - only the total area of the surface. Create additional layers with black shapes in order to mask-out the sections of the image you wish to avoid. Hide the Test Pattern and save the file. Remember to keep your white background or else no video will pass through! Mask Image - double-click the blank area and browse to your mask image or drag your mask from Finder into this area. You can continue to edit your mask in another application and Qlab will automatically pull changes from this file.